The creek splits into two parts before dropping over a small cliff during normal flow, with most going river right. Both drops are steep cascades with free-falling sections. 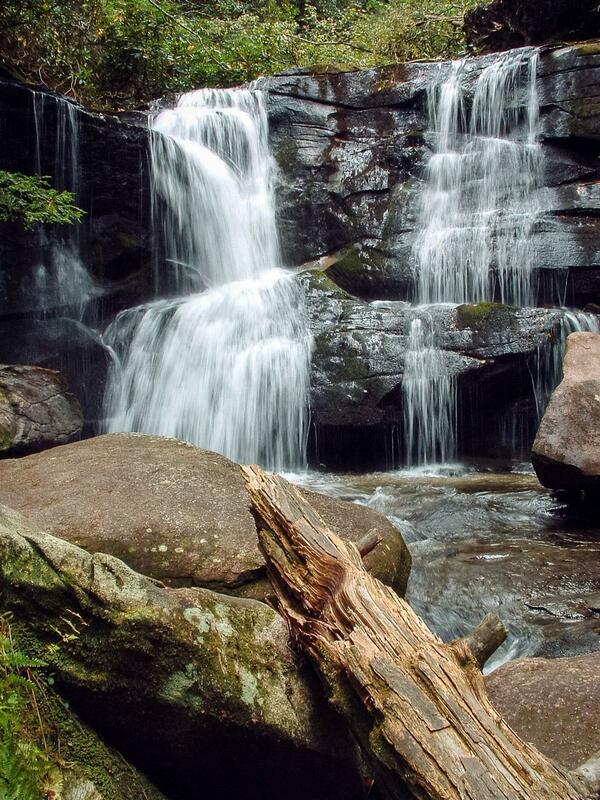 The rocks and forest around the falls are lush and green, save for the dying hemlock trees that grow nearby. It's not tall, but it's beautiful and the water is exceptionally clear. This marks the beginning of a steep section of the stream, below the relatively flat and calm sections upstream in and around Picklesimer Fields. From the intersection of US Hwy 276 and 64 and NC Hwy 280 in Brevard, follow US 276 west for 5.2 miles. There are signs for Pisgah National Forest. Turn left onto FS 475, following signs for the Pisgah Center for Wildlife Education. The parking area is 1.4 miles ahead, on the left after crossing a bridge over the Davidson River. The trail passes above the weir for the fish hatchery, then begins winding along the slopes above the creek. As the trail starts approaching the creek again, you'll start to see the falls through the trees to the left (especially in winter) now that the hemlocks are dead. Continue to a side path down to campsite with a small cascade upstream. The main falls is below this campsite area. A scramble path leads to the base. Keep to the left to avoid the drop-off near the falls, for an easier descent past a small overhanging rock cave.